Sealaska Heritage Institute (SHI) will introduce several new events at Celebration 2016 and migrate some features of its biennial, dance-and-culture festival to the new Walter Soboleff Building in Juneau. New events include a Native Fashion Show, Juried Youth Art Exhibit, a Ravenstail and Chilkat weaving presentation and class, a comic routine and a jazz piano concert. 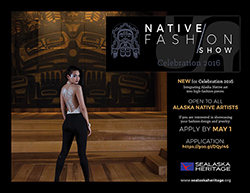 SHI will sponsor a Native Fashion Show in an effort to showcase and encourage the integration of Alaska Native art into high-fashion pieces. The show will include an opening performance by emcee Phillip Blanchette—an award-winning performing artist originally from Bethel, followed by a segment showing traditional wear, such as button blankets and Chilkat weavings. Contemporary designs by Dorothy Grant will take the stage, followed by contemporary fashions by nearly 20 designers from across the state representing numerous Alaska Native cultures. The event was coordinated by Diana Velez, who has a passion for fashion and has helped out or been a part of many shows, such as Village Vogue Fashion Show and Where Art Thou, and modeled for Anchorage businesses. Brendan Sullivan will donate hair styling services, donor Heather Sinic will do make up and donor Celeste Worl will provide the music. The fashion show art featuring high-heel shoes with formline design was made by Alison Bremner. The show was developed by a committee that included Bremner, Louise Kadinger, Allyssa London, Maka Monture, Jackie Pata and Celeste and Crystal Worl. The show is scheduled at 6 pm, Friday, June 10, in the clan house at the Walter Soboleff Building, and space will be limited. Tickets are $10 and will be available through Sealaska Heritage and the Sealaska Heritage Store. It will be televised and webcast live, and Celebration attendees may also watch the fashion show on large monitors at Centennial Hall. SHI also will sponsor a new Juried Youth Art Exhibit in an effort to increase the number of young artists making high quality pieces and to share their work with the public. The youth exhibit will showcase 35 pieces and include 34 objects made by 28 individual young artists and one piece that was made by 61 6th grade students from Dzantik’I Heeni Middle School. Winners will be announced on June 8 at the Walter Soboleff Building during the awards ceremony for the biennial Juried Art Show and Competition (See accompanying press release “SHI to unveil winners of Juried Art Competition, Youth Art Exhibit”). Cash awards will be made to schools of the winners for art supplies to be used for future instruction in Northwest Coast art. All youth chosen to exhibit will receive a specially-made Juried Art Show t-shirt and winners also will receive a certificate. SHI also will sponsor a presentation by weavers Della Cheney, Marsha Hotch, Evelyn Vanderhoop, Suzi Williams, Shgen George, Lily Hope, Clarissa Rizal and the Apron Apprentices, a group that includes Stephanie Anderson, Margaret Woods, Margaret Jeppesen, Sally Ishikawa and Joni Zimmerman. “Ravenstail & Chilkat Weavers Present,” is scheduled from 11:30 am to 2:30 pm, Wednesday, June 8, in the clan house. The weavers also will teach a class from 9 am to 12 pm, Thursday, June 9, on the third floor of the Walter Soboleff Building. Although the class is full, the public is welcome to observe and to interact with the weavers. Suzi Williams will demonstrate spinning of the weft using the thigh spindle, drop spindle and modern-day spinning wheel. She will also demonstrate the traditional method of spinning warp on thighs. Lily Hope and Clarissa Rizal will help weavers begin making their five-inch Chilkat or Ravenstail square for the “Weavers Across the Waters” community robe, for which 54 weavers from the Northwest Coast will contribute a woven square for a Chilkat/Ravenstail robe. The finished robe will be worn in ceremonies for canoe gatherings or the maiden voyage of a traditional dugout canoe. You can follow this project on Facebook. SHI also is sponsoring a comedy show by Tlingit-Yup’ik comedian Cody Ferguson, one of the founders of the Facebook page “Can I Borrow,” through which he and his partner Cody Pequeño (known as Cody and Cody) post comedic videos celebrating traditions and customs with the goal of healing through laughter. The show is scheduled from 5 to 6 pm, Thursday, June 9, in the clan house. The comedy show will be followed by a jazz piano concert by Tsimshian musician Chantil Dukar from 7 to 7:30 pm in the clan house. Dukart is a Miami-based artist who grew up in Colorado and Alaska and plays a mix of funk, jazz, Motown and R&B.